Surrounded by a sea of recruits and the smell of hot brass, it’s easy to spot Staff Sgt. Estefania Patino’s campaign cover and trademark green marksmanship instructor jacket as she patrols Chosin rifle range’s firing line, inspecting weapons and encouraging shooters as they sight in on their targets. Patino is a Primary Marksmanship Instructor; a Marine whose job it is to make riflemen out of the recruits. To them, she is a shooting guru; but they would never guess that prior to joining the service Patino had never fired a weapon. A Laredo, Texas native, Patino first developed her interest in shooting during recruit training, where she, like many Marines, fired a weapon for the first time in her life. It was not a natural experience for Patino, who struggled at first. While stationed in Okinawa, Patino volunteered to go through the Combat Marksmanship Coach Course, where she honed her rifle marksmanship skills and learned to shoot a pistol for the first time. She said there were a lot of “Teachbacks” during the course, where Marines had to memorize certain knowledge and teach it back to their instructors. Where other Marines struggled, Patino excelled, and her love for teaching grew along with her love for shooting. Patino later volunteered for Drill Instructor Duty and was sent to Marine Corps Recruit Depot Parris Island. While training recruits, she noticed there were trends of female recruits not performing as well on the range as Patino felt they could. Utilizing her past experience as a marksmanship coach, she stressed the importance of marksmanship knowledge to her recruits and in turn, her platoons were recognized for their improved performance. Patino, with the backing of her leadership at 4th Recruit Training Battalion, was determined to excel at the job. The transition from drill instructor to marksmanship instructor was a bit of a culture shock, Patino said. Her senior drill instructor trained her to be an aggressive leader, and her recruits knew it; but as a PMI, Patino realized she had to reel in her intensity for the sake of the recruits. They couldn’t be at the position of attention; they couldn’t yell back commands because it would alter their shooting negatively. Patino learned to drop the persona of the hard-nosed DI and relate to recruits on a personal level. “I don’t see female or male Marines, I see the quality of a Marine and I put myself in their position,” said Patino, describing her teaching process. Gunnery Sgt. Angelica Dixon, senior drill instructor for Platoon 4036, Oscar Company, and a close colleague of Patino’s said it was her passion for teaching that drove her to pursue becoming a PMI. 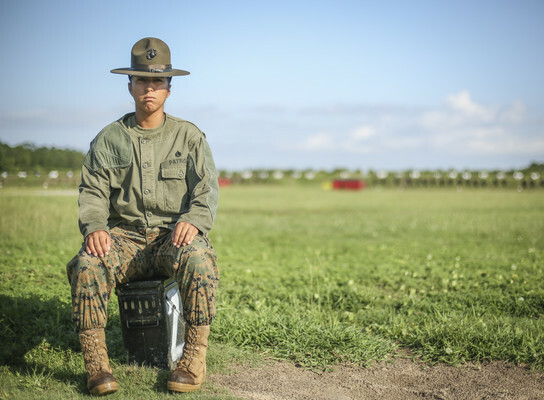 Dixon added that Patino’s drive for mentoring and coaching on the range opened the door for more female drill instructors to pursue becoming PMIs. Patino will continue as a PMI on Parris Island for the next four to seven months before returning to drill instructor duty, where she hopes to become a senior drill instructor and a chief drill instructor before returning to the fleet.